SGC SUPER LIVE Asia tour coming this November. Collaboration show with Korean wave top artist! 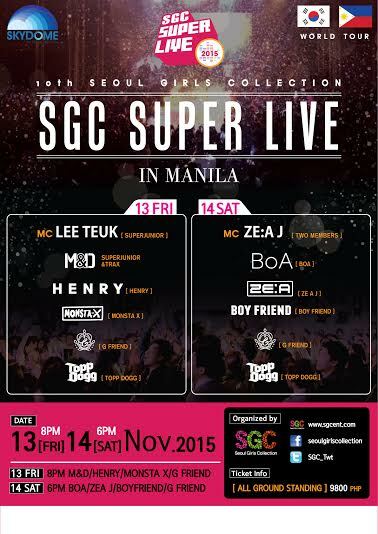 SEOUL GIRLS COLLECTION (SGC SUPER LIVE) is starting their Asia tour this November. This Seoul Girls Collection Asia tour will be held in 3 cities including Manila Philippines, Bangkok Thailand, and Singapore with Korea’s top artist. The first city to hold the show is MANILA, starting November 13 to 14 at SM SKYDOME. SEOUL GIRLS COLLECTION Show, celebrating the 10th anniversary by SGC SUPER LIVE IN MANILA, is an entertainment show focused on the trend and presenting a new approach to fashion and K-pop. Planning to introduce the excellence of the nation’s fashion brand by performing K-pop concert in collaboration with 10 to 30’s young woman’s ‘Real Clothes’ concept, presenting domestic and foreign famous brands and street fashion at the same time. Many top K-pop artists will be performing on SGC SUPER LIVE IN MANILA. Eye of the K-pop storm, Super Junior’s LeeTeuk has been selected 13th special MC for the show. And ZE:AJ’s member has been selected 14th special MC for the show. The Asia star BoA is joining SGC SUPER LIVE IN MANILA. Also WooJoo Star Kim-HeeChul and talented musician JungMo’s collaboration! M&D, Super Junior’s Henry, ZE:AJ, Boyfriend, 9muses, Monsta X, GFRIEND and ToppDogg is joining for a spectacular show of SGC SUPER LIVE IN MANILA. Audiences can enjoy various artist’s performance and fashion show at the same time by 20~30 minute mini concert format SGC SUPER LIVE. And fans of the participating artists can also enjoy by their long performances. ‘SGC SUPER LIVE’ was planned by ‘Seoul Girls Collection’ to introduce the excellence of the nation’s fashion brand. And was awarded by the Korean Trade Association’s 1 million dollars export award. ‘SGC SUPER LIVE IN MANILA’ is organized by ‘Seoul Girls Collection’ and PULP Magazine PH. 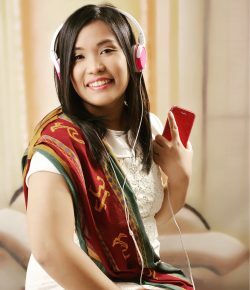 Get your tickets soon via SM TICKET Outlets Nationwide or call 470-2222 or online at www.smtickets.com!